We had been talking about installing an inground pool for years, and finally decided 2009 was to be the year. After researching and meeting with several pool companies we elected to put our trust in Waterworld. What a wonderfully wise choice this turned out to be. In this day and age of diminishing customer service Waterworld surpassed all of our expectations and the result was a beautifully designed and installed deck, pool and waterfall of a quality well beyond what we imagined. From day one Waterworld's staff were just super to have around and bent over backwards to ensure their workmanship was top notch. The completed project exceeded all our expectations and we could not be happier. I would recommend Waterworld to anyone looking for tremendous value and quality workmanship. 1984 Olympic Swimming Gold, Silver, Bronze medalist. "I thank you kindly for my beautiful backyard. Our pool is lovely and we are really enjoying it. You were a great company to deal with and I thank you!" "The pool is amazing and I am very happy with the results. Please pass along the great work that your staff has done, to all those involved. Thank you very much for your service." "Peter and I just wanted to tell you how happy we are with our new swimming pool. The installation of the equipment is neatly organized and was thoroughly explained by your men. Your staff were patient to explain the operation of the system and returned when I got confused about a couple of items. They even followed up to ensure I wasn't having any problems. It sure is great to know customer service is still important to your company. The pool is great, crystal clear and easy to maintain. We are enjoying the salt water so much, it was the right choice. Please thank all your staff for their efforts and extra time spent with me to ensure we were happy. Certainly a pleasure doing business with Water World Pools." I would not hesitate to recommend your company to anyone without the slightest reservations. Our experience has demonstrated to us that you truly stand behind your work. When it comes time for us to put in a home spa/hot tub we will only call one supplier, namely Water World." "Carla and I would like to thank you and the Water World crew on the completion of our pool. We can honestly say that we have never worked with a more professional, friendly group. Every stage of the build was explained in detail along with offers of many friendly modifications to the original plan. Again, thanks for all the help, we're already enjoying our pool daily." Hi Cheryl & Darryl We wanted to send you a letter regarding the installation of our pool, and your staff. We are really impressed with the dedication and thoroughness to which our contract was carried out. We are so thrilled with our new pool! The kids couldn't be happier, especially our daughter who was able to have a pool party for her birthday within only three weeks of our pool being started. Your staff from the dig crew to the fence builder "Gerry" and finishing crew, always conducted themselves with a high degree of professionalism. Ryan especially sets a very high standard, to which we should all aspire to emulate. Quick with a smile, and always equally as quick to offer assistance when we had a question or concern regarding the pool. Ryan is a credit and an asset to Water World. Often times people are quick to complain and vent their frustrations. We believe that it is equally important for us to give credit where it is due, and acknowledge a job well done! Thank-you "ALL" again! There are not enough good things we can say about Water World Pools from Peterborough. The decision being made to remove our existing 37 yr. old pool and reinstall a brand new one in the same opening took weeks of discussion and planning. We were fortunate to have Brian Healey, the owner of Water World Pools, attend to our many questions and concerns. Brian not just came once, he returned several times as our questions grew more in depth. The job began in earnest on September 9th. Before this start date we ourselves had many chores to attend to in regards to removing everything like existing perennial gardens to open a pathway for the large equipment to be brought in. Right on queue the machinery arrived, the old pool being demolished in front of our eyes. We were stunned how easily this transition happened. Our access space was crowded, the pool itself large at a length of 38 feet, but these men and their expertise in no time at all removed the old and began reconstruction of the new. Water World have excellent crew, men that are knowledgeable, hardworking and so courteous. Cold, heat, rain, wind, the job progressed smoothly, day after day, week after week. We logged pictures from the first day to the very last watching as our back yard was transformed to an awesome space. This space is our cottage, our retreat, our family hub. All spring, summer and fall we utilize this backyard oasis. The job was completed in a time span of six weeks. From the derelict to the beautiful, what a wonderful job this company does. In closing and to put everything in the proper perspective, Water World Pools did nothing short of a tremendous job for us. Our recommendation for this company is absolute! To the work crews, the administrative staff and the Healey family, we extend our gratification for the entire project going way beyond and above our expectations. Kudos to a job well done! Thank you Water World Pools!!! 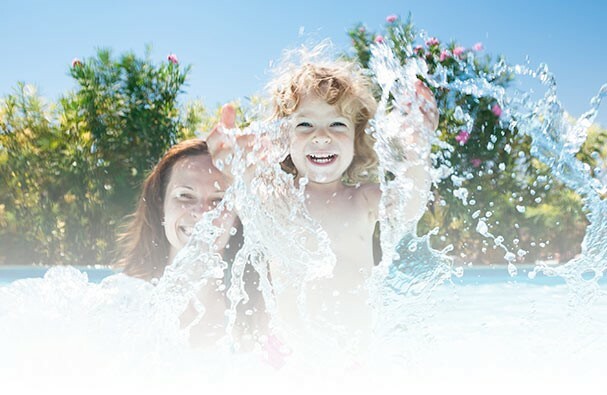 Our experience with Water World Pools has been nothing less than exceptional. From their quick quote and service/product expertise, to the entire team and their installation and attention to detail, it has been a pleasure. Friendly and informative every step of the way, Water World Pools certainly exceeded all expectations in every aspect. Thank you! It’s been a few years since we worked with WaterWorld to install our first in ground pool and now we have moved and circled back for round 2 with another install. Our first pool we interviewed probably half a dozen pool installers and in the end went with a WaterWorld pool. Based on our first pool install, the quality of work and the team doing the install, we interviewed NO other company for this install – it was a no brainer for us to hire WaterWorld to install our 2nd pool. Now that the work is done, there is still no doubt in our minds WaterWorld is the best choice. There is nothing more re-assuring when you invest a large amount of money and time into a project and are met with workers that treat the project like they are building this pool in their own backyard. I spent many hours talking with various WaterWorld employee going over ideas, concepts, what they were doing, what they envisioned, etc. and at no time did I ever feel rushed or like I was pulling them away from their work. They dedicated their time to keeping us informed through the whole process and involving us in all decisions throughout the build. On the back end of things, we were in constant communication with Cheryl who kept us up to date with what crews were going to be onsite and what work we could expect to be completed. In the end, we have done two in ground pools with WaterWorld and wouldn’t hesitate for a second to recommend them to our friends and family who are looking to have a pool installed. They are top notch right from the owners down to every member of all their crews! !